342 Marlborough is located on the south side of Marlborough, between Gloucester and Hereford, with 340 Marlborough to the east and 344 Marlborough to the west. 342 Marlborough was built in 1876-1877 by Keening & Fellows, masons, for real estate dealer Henry Whitwell, for speculative sale, one of five contiguous houses (338-340-342-344-346 Marlborough) they built for him in 1876-1878. He is shown as the owner on the original building permit application for 338-340-342 Marlborough, dated September 30, 1876, and on the final inspection, dated May 8, 1877. No architect of the houses is indicated. Click here for an index to the deeds for 342 Marlborough. The house was shown as vacant in the 1878 Blue Book. By the 1878-1879 winter season, 342 Marlborough was the home of marine and fire insurance agent Edward Dehon Blake and his wife, Annie A. (Chase) Blake. They previously had lived at 21 West Cedar. 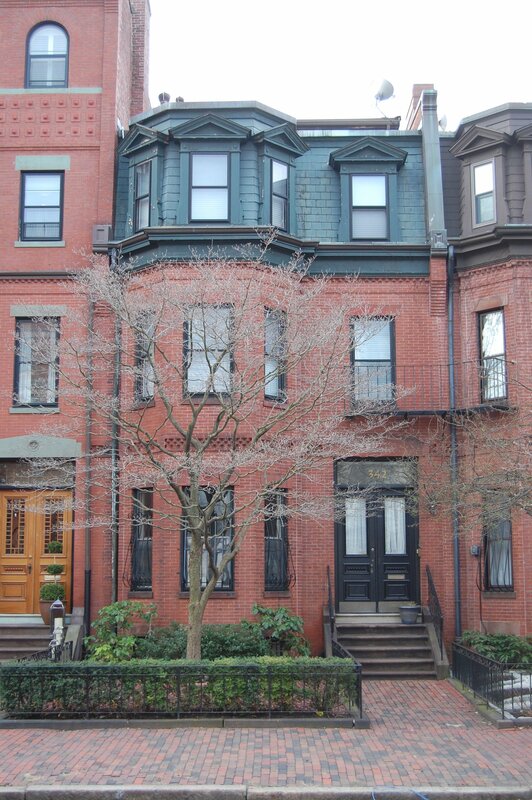 They continued to live at 342 Marlborough during the 1880-1881 season, but moved thereafter to 29 West Cedar. On June 11, 1881, 342 Marlborough was purchased from Henry Whitwell by Jane Rebecca (Balch) Sears, the wife of real estate broker Eben Sears. They previously lived at 344 Marlborough. They continued to live at 342 Marlborough during the 1895-1896 winter season, but moved thereafter to Newton. On October 31, 1896, 342 Marlborough was acquired from Jane Sears by Alice Darracott (Nason) Buckingham, the wife of Dr. Edward Marshall Buckingham. He was a physician and also maintained his medical offices there. They previously had lived (and he had maintained his office) at 53 Worcester. The Buckinghams’ daughters, Edith Nason Buckingham and Margaret Buckingham, lived with them. Margaret Buckingham married in March of 1915 to Addison Gulick, a university professor in Columbia, Missouri, where they lived after their marriage. Edward Buckingham died in December of 1916, and Alice Buckingham died in July of 1919. 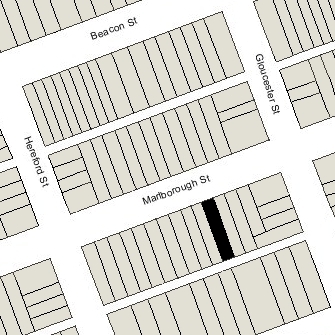 On November 5, 1920, Margaret (Buckingham) Gulick transferred her interest in 342 Marlborough to her sister. Edith Buckingham continued to live at 342 Marlborough. During the 1919-1920 winter season, she was joined by Sarah Williams (Slack) May, the widow of George Warren May. By the 1920-1921 season, Mrs. May had moved and Edith Buckingham had been joined by Miss Emily G. Fish. They continued to live there until the 1926-1927 winter season. They then traveled abroad and later lived in Sudbury. On September 9, 1927, 342 Marlborough was acquired from Edith Buckingham by Miss Fannie D. Morse. She previously had lived at 123 Newbury. She continued to live at 342 Marlborough until her death in October of 1935. The house was not listed in the 1936 and 1937 Blue Books, and was shown as vacant in the 1937 City Directory. On May 15, 1936, 342 Marlborough was acquired by Miss Rose M. Levaggi. Living with her were her brother-in-law and sister, Alfred DiPesa and Maria (Levaggi) DiPesa. He was treasurer of Levaggi’s Downtown Restaurant. They all previously had lived at 91 Westland. On June 9, 1939, Lena Mandel foreclosed on a mortgage given by Rose Levaggi and took possession of the property. On June 21, 1939, it was acquired from her by the Humboldt Realty Trust, Inc.
By 1939, 342 Marlborough was the home of Matthew W. Bradley, a plumber, and his wife, Anna Cecilia (Johnson) Atkinson Bradley, who operated it as a lodging house. They previously had lived at 41 Symphony Road. They continued to live at 342 Marlborough in 1940. In February of 1940, Jacob Fine, a mason, probably acting on behalf of the Humboldt Realty Trust, applied for (and subsequently received) permission to convert the property from a single-family dwelling into a lodging house (legalizing its current use). On July 19, 1940, the State Street Trust Company and Benjamin C. Tower, trustees for the benefit of Betsy Tower, foreclosed on a mortgage they held and took possession of the property. On August 15, 1940, 342 Marlborough was acquired from the trust by Mary F. Donlan. 342 Marlborough was shown as vacant in the 1941 City Directory. On September 23, 1941, 342 Marlborough was acquired from Mary Donlan by William David Laundrie. He and his wife, Sophia Biggs (Sweezey) Laundrie, made it their home. They previously had lived at 2 Mt. Pleasant Terrace. He was manager of the Hotel Manger on Causeway Street. In November of 1941, William Laundrie applied for (and subsequently received) permission to convert the property into three apartments. William and Sophia Laundrie continued to live in one of the apartments at 342 Marlborough until about 1964. It appears that the house was subdivided into two apartments, rather than three as approved in 1941. On May 1, 1964, 342 Marlborough was acquired from William Laundrie by Laurel (Maillaux) Moran Lowell, the former wife of Ralph A. Moran and the widow of Wharton Lowell. On August 28, 1969, she transferred the property to the Wharton Lowell Trust. Laurel Lowell lived in one of the apartments at 342 Marlborough until the late 1970s. On September 22, 1978, 342 Marlborough was acquired from the Wharton Lowell Trust by Samuel B. Rosenberg. 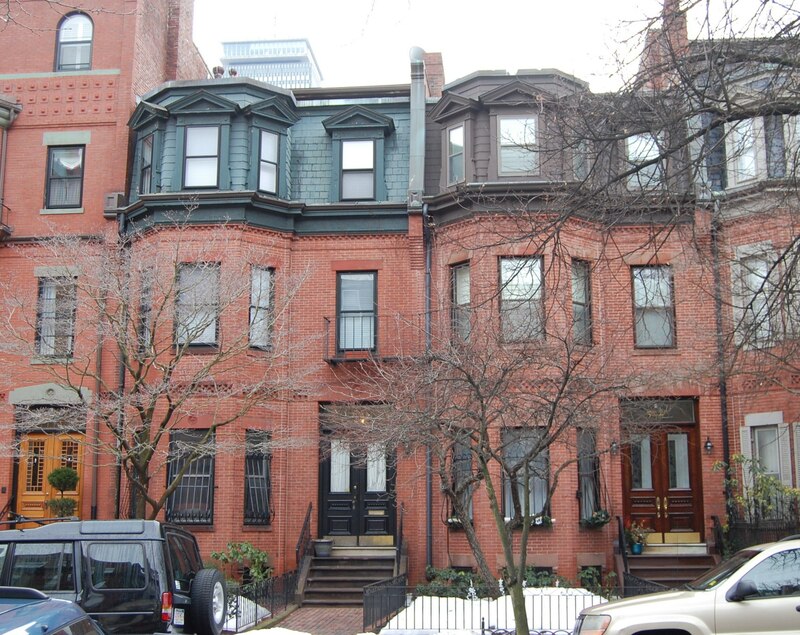 On October 12, 1978, he converted the property into two condominium units, the 342 Marlborough Street Condominium.